This is SOLO IN OHIO, our live podcast event recorded in front of a packed house of STAR WARS fans in Cleveland at the Playhouse Square Theater. Joining us on this amazing evening was RFR brother/fan fave Billy “Dee” McInerney along with our original brother-in-the-Force and co-host from our early days, Pete Nadel – A true STAR WARS podcast pioneer. But our most special guests were our audience. The mic was open all night for members of the RFR community to jump in on the conversation. We talk all about SOLO in this SPOILER HEAVY discussion. This show was recorded on opening night for the movie and it captures the excitement only a room full of die-hard STAR WARS fans can create. Full report from the world premiere for SOLO: A STAR WARS STORY with audio highlights from the red carpet with the cast and crew. Some of the biggest news to come from the premiere had nothing to do with SOLO, but instead, we got our first bits of info about the upcoming STAR WARS live-action TV show from the series creator himself, Jon Favreau. Also walking the red carpet was Dave Filoni, who talked a little about STAR WARS RESISTANCE, but was cagey about where his future in STAR WARS is heading. We analyze what was said and what it could mean. “Prophet…Or Loser (Solo Edition)” with F.J. DeSanto is back! Hear F.J.’s final round of predictions before the release of SOLO. 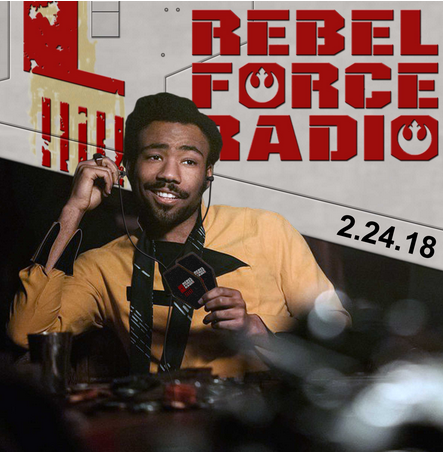 Also in this mega-sized RFR, Donald Glover brings Lando to SNL, Mark Hamill attends a wedding on THE BIG BANG THEORY, we hear the voice of Enfys Nest for the first time, and the story of how Swank got stuck in Chicago. RFR preps for SOLO: A STAR WARS STORY and reviews the latest SOLO news, audio highlights from interviews with the cast and crew, and speculation about how the characters will be portrayed. We talk about May The Fourth activities and events happening in Chicago and we look at the most popular STAR WARS films in the US state-by-state. Chris Baker from Zen Studios joins us to talk about the extremely fun and addicting STAR WARS PINBALL, and he answers questions about his fandom via our famous Yoda Questionnaire. Plus, Star Wars cosplay dos and don’ts, Helen Hunt’s fandom is revealed, Nissan has an amazing Star Wars sweepstakes, Moralo Eval, listener mailbag, voice mail and more! STAR WARS RESISTANCE was announced this week as the next animated series coming from Lucasfilm. Join us on RFR as we provide a full breakdown of the press release description of this new, anime-inspired series to debut this fall. New TV spots featuring previously unseen footage and dialog from SOLO: A STAR WARS STORY have been hitting lately. We get our first listen to Jon Faverau’s character Rio, and discuss an alien species originally seen in THE CLONE WARS making their silver screen debut in SOLO. Speaking of SOLO, Alden Ehrenreich will be featured in an Esquire Magazine cover story and he says some interesting things about his future with the franchise. Jason’s son Parker Swank provides us with a kid-sized STAR WARS perspective, along with hilarious character impressions. Listener voice mail prompts discussion about the Jedi afterlife and The Star Wars Holiday Special, and we bring news to make the Kitster Nation rejoice! Can Luke Skywalker return from the dead in STAR WARS EPISODE IX? Not as a ghost, but as a corporeal being? We look at George Lucas’s early concepts for Obi-Wan to return in the flesh via the rough draft for RETURN OF THE JEDI and we wonder if such an idea can be used to bring back Luke. Speaking of Luke, Mark Hamill continues his interview tour and we have some select highlights to inform and entertain you. We continue to dissect the novelization for THE LAST JEDI, we get intimate with THE EMPIRE STRIKES BACK director Irwin Kershner, and we mourn the loss of Toys ‘R Us. Plus, listener voice mail, the worst jobs in the STAR WARS galaxy, a SOLO IN OHIO update, and we announce the winner of our big Star Wars Top Trumps giveaway! The novelization for STAR WARS: THE LAST JEDI gets our review with highlights from the audiobook featuring some shocking moments not featured in the final film. Speaking of the film itself, we have more to say about THE LAST JEDI home video release. Voicemail sparks another debate over the Anakin/Vader transformation. In news, we follow Mark Hamill to SWSX in Austin all the way to Dublin, Ireland. Mark never fails to entertain when it comes to sharing his Star Wars insights and opinions! The maestro John Williams talks about his future in STAR WARS and his thoughts on Rey’s parents on KUSC radio. RFR is proud to present SOLO in OHIO, happening May 25th in downtown Cleveland. We have the latest details! We look back at the history of Star Wars home video releases and share our memories from VHS to Blu Ray. Plus, Ziro The Hutt, and we’re giving away a huge STAR WARS TOP TRUMPS prize to a lucky RFR listener…Find out how you can win! The home video release of STAR WARS: THE LAST JEDI hit earlier this week and, along with the movie, tons of bonus features including the full-length documentary “The Director and The Jedi”. We review this new and through behind-the-scenes account of Episode VIII with analysis and audio highlights. We also dive into Rian Johnson’s audio commentary track and discuss some of the broader themes and events of THE LAST JEDI, especially the death of Luke Skywalker. And speaking of Luke, Mark Hamill was in Hollywood last week for the unveiling of his star on the Walk of Fame and the RFR microphones were there. Hear from Hamill himself along with a couple of his friends: George Lucas and Harrison Ford. Plus, more details on our big SOLO IN OHIO event coming this May, some Star Wars Lego conversation, and more. We review some of the big STAR WARS reveals at the 2018 NY Toy Fair that have fans buzzing. Collecting expert Dan Curto joins us to break down all the news, including new merchandise from SOLO: A STAR WARS STORY and the ambitious Jabba’s Sail Barge from Hasbro’s new crowd-sourcing initiative, Haslab. We also talk critically about Star Wars collectibles on the retail level, what works, and what doesn’t. That familiar scream you hear on TV and in movies, The Wilhelm Scream, was an originally inside joke from 1977’s STAR WARS that has since spread like wildfire. Now comes word that it has been “retired” by Skywalker Sound, thus we will not be hearing it in STAR WARS again. We investigate this news and look back at the history of The WIlhelm Scream via vintage RFR highlights featuring STAR WARS sound masters Matthew Wood and Ben Burtt. Plus, J.J. gives an Episode IX update, we look forward to the home video release of THE LAST JEDI, Lando Calrissian pickup lines from Billy Mac and more! RFR LIVE returns for this listener call-in episode of recorded on December 15th – Opening day for STAR WARS: THE LAST JEDI. For almost two hours, we take your calls, uncensored and unscreened. We listen to your reviews and analysis of the latest theatrical release of the saga…From your likes and dislikes, to your emotions and feelings, favorite character moments, action sequences and more, with a little Episode IX speculation along the way. It’s a full show dedicated to listener feedback and you certainly have a lot to say about THE LAST JEDI! With STAR WARS: THE LAST JEDI hitting theaters in a mere two weeks, anticipation is reaching a fever pitch. With members of the cast hitting the talk show circuit, we are digging deep for any clues we can discover about the upcoming film. We have audio highlights from Daisy Ridley, John Boyega and director Rian Johnson from the latest stops on THE LAST JEDI media tour and new Rolling Stone cover story. In the latest installment of “Prophet or Loser”, filmmaker F.J. DeSanto returns to update his many Episode VIII plot predictions that he originally made in April. Plus, Nissan reveals STAR WARS cars at the LA Auto Show, looking back at the FAMILY GUY STAR WARS parodies, and more STAR WARS socks from Stance to giveaway! All-New STAR WARS trilogy announced with Rian Johnson at the helm! All-New live-action STAR WARS TV Series in development! And, an all-new RFR is here to bring you our take on this monumental breaking news! We discuss the future of STAR WARS in the wake of these huge announcements and offer tons of speculation about where and when these new projects will take place on the STAR WARS timeline. In current news, STAR WARS: FORCES OF DESTINY continues to break new ground by spotlighting the strong women of the saga. Writer Jennifer Muro joins us IN THE CANTINA. We talk about her experience creating new STAR WARS stories for these amazing animated shorts and her passion for the galaxy far, far away. The countdown to THE LAST JEDI continues and we review the latest interviews with Mark Hamill to look for clues about what to expect from Luke Skywalker in Episode VIII. Plus, listener feedback, voice mails, and STAR WARS IN POP CULTURE visits “The Goldbergs” and “Stranger Things 2”.